The public continues to view the economic system as unfair to most Americans, while a substantial majority regards economic inequality as either a very big or moderately big problem. As has been the case for the past two decades, most Americans say it is possible to get ahead through hard work, though Democrats have become increasingly skeptical that hard work can guarantee success. There has been little change as well in public attitudes about corporate profits, with a majority of Americans viewing profits as excessive. And as Congress begins to consider proposals for reforming the tax system, the survey finds little support for reducing taxes on high-income households or large businesses and corporations. Far more Americans favor increasing than lowering taxes on both. Americans are broadly skeptical of the fairness of the U.S. economic system. About two-thirds (65%) say the economic system in this country unfairly favors powerful interests, while 32% say the system is generally fair to most Americans. These views have changed little since the question was first asked in 2014, but partisan differences have widened. Democrats and Democratic-leaning independents overwhelmingly see the economic system in this country as unfair: 82% say this, while just 17% think it treats most people fairly. The share of Democrats who say the economic system is unfair has grown 11 percentage points over the past three years. 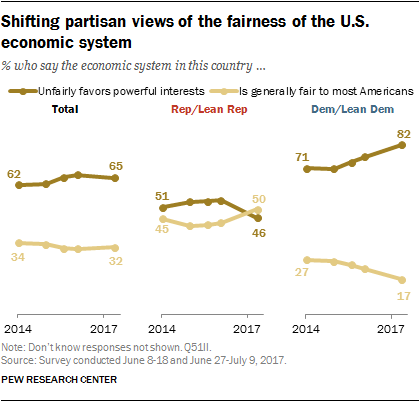 By contrast, Republicans and Republican leaners are roughly divided in their views of the U.S. economic system: 50% say it is generally fair to most Americans, while nearly as many (46%) say it unfairly favors powerful interests. In recent years, including as recently as March 2016, somewhat more Republicans said the economic system unfairly favored the powerful than said it generally treated most people fairly (54% vs. 44%). By 55% to 42%, conservative Republicans say the U.S. economic system is generally fair to most Americans. Moderate and liberal Republicans tilt in the opposite direction: 55% say the system unfairly favors powerful interests, while fewer (42%) say it’s generally fair. Among Democrats, liberals (88%) are somewhat more likely than moderates and conservatives (77%) to say the U.S. economic system is unfair. Along with skepticism about the fairness of the economic system, most Americans view economic inequality as a problem in the country. Overall, 48% say economic inequality is a “very big” problem in the country and another 34% say it is a “moderately big” problem. Relatively few say it is a small problem (10%) or not a problem at all (5%). Blacks (65%) and Hispanics (55%) are more likely than whites (42%) to see economic inequality as a very big problem in the country. Across levels of family income, 56% of those living in households earning less than $30,000 a year say economic inequality is a very big problem. Somewhat fewer of those in households with higher incomes say the same. And there is a wide partisan divide in views of economic inequality. Two-thirds of Democrats and Democratic leaners (66%) say economic inequality is a very big problem in the country today; 27% say it is a moderately big problem. Among Republicans and Republican leaners, only about a quarter (26%) say economic inequality is a very big problem, while 43% say it is a moderately big problem. Within both parties, there are significant divides on this question by ideology. Conservative Republicans (23%) are less likely than moderate and liberal Republicans (32%) to view economic inequality as a very big problem. Among Democrats, 74% of liberals see economic inequality as a very big problem, compared with 59% of moderates and conservatives. Within the GOP, there also are differences in views by levels of family income. Republicans earning less than $30,000 a year (40%) are much more likely than those with higher incomes (22%) to view economic inequality as a very big problem in the country. 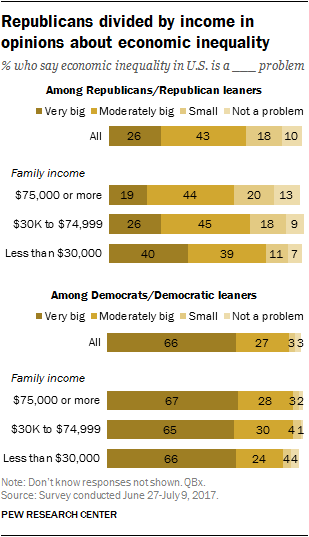 Among Democrats, there is little difference in views across income levels. While Americans see economic inequality as a problem and have doubts about the fairness of the economic system, they maintain a fundamental belief in the ability to succeed through hard work. About six-in-ten (61%) say that most people who want to get ahead can make it if they’re willing to work hard; by contrast, 36% say that hard work and determination are no guarantee of success for most people. Majorities of most demographic groups believe that people can get ahead if they’re willing to work hard. Since 1994, Republicans and Republican leaners have been consistently more likely than Democrats and Democratic leaners to say people can get ahead through hard work. But the gap has widened in recent years, as the share of Democrats who see hard work as a guarantee of success has declined. Through the 1990s and 2000s, majorities of Democrats said hard work leads to success for most people, but that figure dipped to 48% in late 2011. Since then, Democrats’ views have fluctuated; today, 49% say most people can get ahead through hard work. By contrast, for the past two decades about 70% or more Republicans have consistently said hard work leads to success. Among Democrats, whites are more skeptical than either blacks or Hispanics that hard work leads to success. And while 57% of Democrats with at least a four-year degree say hard work is no guarantee of success for most people, fewer Democrats (45%) with less education say this. Although some of the educational gap among Democrats reflects racial and ethnic differences in educational attainment – as with the public overall, white Democrats are more likely than black and Hispanic Democrats to have a college degree – the gap is evident among whites. Six-in-ten white Democrats with a college degree say hard work is no guarantee of success, compared with 53% of white Democrats without a degree. Large majorities of Republicans with four-year degrees (82%) and those who have not completed college (76%) say most people can get ahead with hard work. The public holds a critical view of corporate profits. Overall, 59% say that business corporations make too much profit, compared with 36% who say most corporations make a fair and reasonable amount of profit. Overall, 73% of Democrats and Democratic-leaning independents say business corporations make too much profit. By 52% to 43%, more Republicans and Republican leaners say corporations make a fair and reasonable amount of profit than say they make too much. Among Republicans, those with lower levels of income and education are more critical of corporate profits than those with higher incomes and more education. While 59% of Republicans with family incomes of $75,000 a year or more say corporations make a reasonable amount of profit, 42% of Republicans making less than $30,000 a year say the same. Similarly, by roughly two-to-one (65% to 30%) Republicans with a college degree say corporations make a fair profit. Among Republicans without a college degree, views on corporate profits are split (47% too much profit, 47% reasonable profit). Majorities of Democrats across levels of income and education say business corporations make too much profit. About half of Americans (52%) say that taxes should be raised a lot or a little on large businesses and corporations. Only about quarter (24%) say taxes should be lowered a lot or a little, while 21% think taxes on corporations should be kept the same as they are now. Americans are somewhat less supportive of raising taxes on those with household incomes over $250,000: 43% say taxes on high incomes should be raised (by a lot or a little), 24% say they should be lowered and 29% think they should be kept the same as they are now. 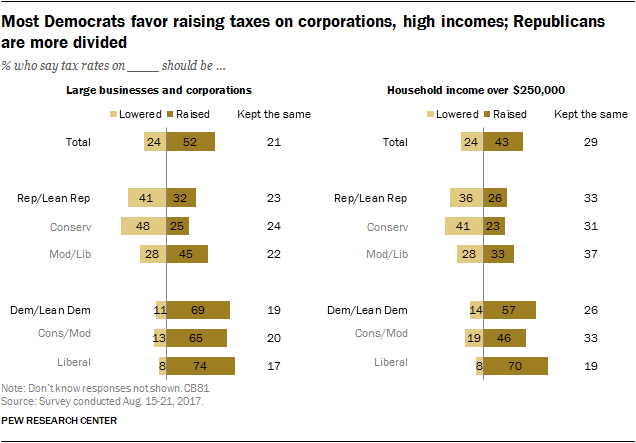 Among Republicans and Republican leaners, 41% say taxes on corporations should be lowered, while nearly a third (32%) favor raising them; 23% support keeping corporate taxes as they are. More conservative Republicans (48%) than moderate and liberal Republicans (28%) favor cutting taxes on corporations. Among Democrats, there are more modest ideological differences in views of corporate taxes. Republicans are divided in opinions about tax rates for household incomes over $250,000. While about a third (36%) say they should be lowered, nearly as many (33%) say they should be kept at their current rate and 26% favor raising taxes on high incomes. Most Democrats (57%) say taxes on household incomes of more than $250,000 should be raised, but this attracts much more support from liberal Democrats (70%) than from conservative and moderate Democrats (46%).